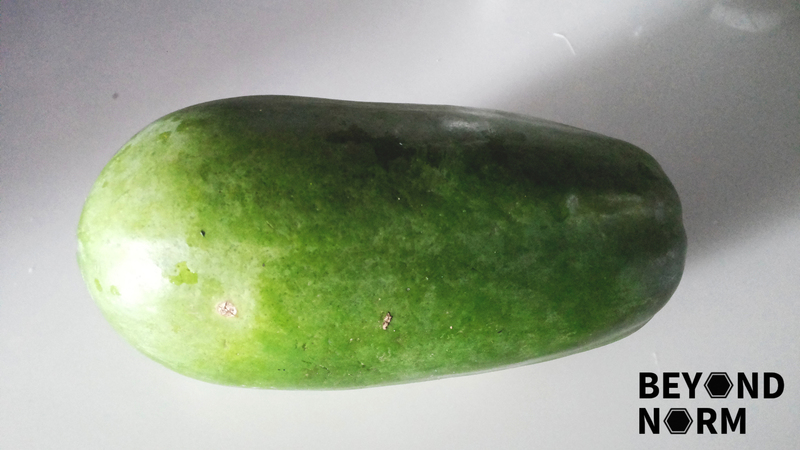 I was really excited when I saw this green papaya at one of the vegetable stalls in the market the other day as I needed one to make this hot-sour-sweet-and-salty flavourful salad; Green Papaya Salad or Som Tum in Thai. 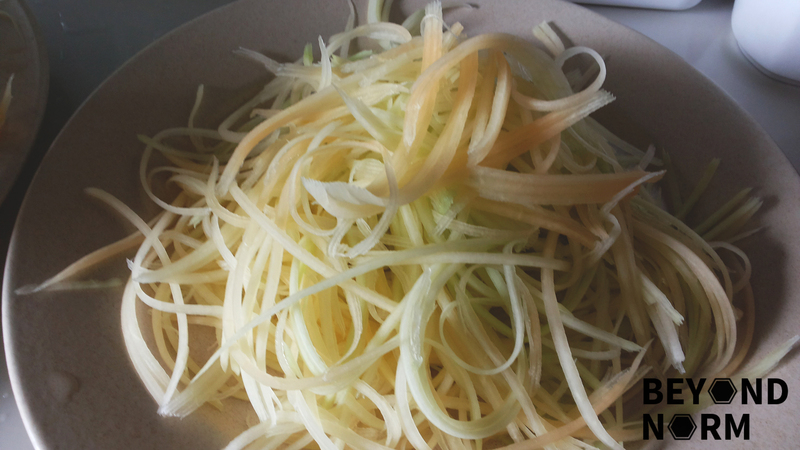 Well, well, even though it is not a Thai green papaya but the outcome still taste delish. I was also glad that I have a pestle and mortar in my kitchen to prepare this dish. (Hahaha. So Thai!!) Don’t worry if you do not have one as you can still use a food processor to assist you in making this wonderful salad. Clean and peel off the skin of papaya. 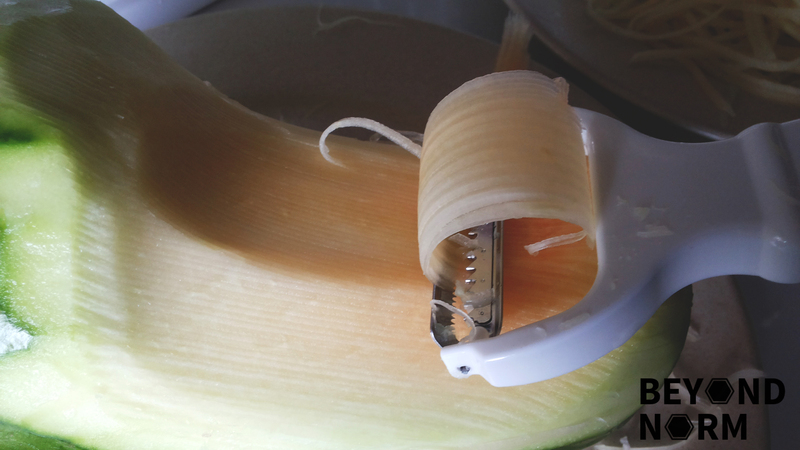 Shred the green papaya with a regular cheese grater or a shredder. When you get closer to the center, you will see the white immature seeds inside. Stop and move onto another part of the papaya. Discard any seeds that gets into your bowl. If you have a food processor with a grater, you can use that to shred the papaya faster. Now the exciting and fun part begins! 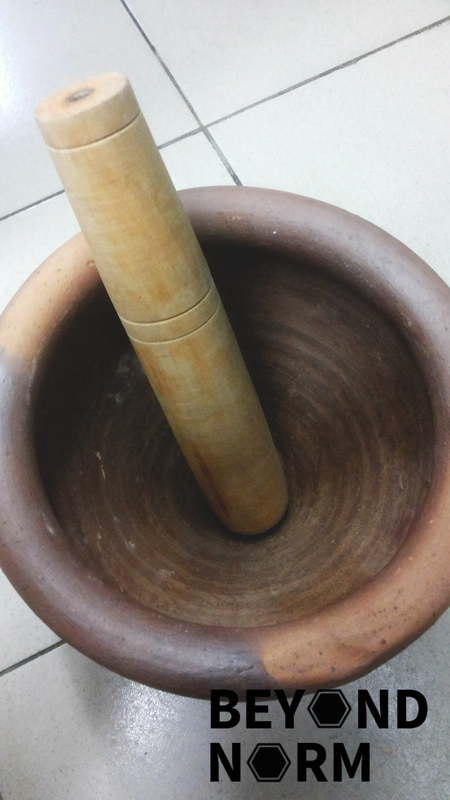 Smash your clove of garlic and chilli with the mortar and pestle. Add halved cherry tomatoes. Pound to get the juice out of the tomatoes. Add the green papaya, fish sauce, lime juice (Add half first and taste. If not sour then add more accordingly), sugar and the chopped peanuts. Use the pestle to push the mixture up in the mortar and the spatula to push it down so that the mixture is mixed well. However, if you do not have a big enough mortar you can crush the garlic, tomatoes, and green beans. Set them aside in a large bowl. Add dried shrimp, fish sauce, lime juice and palm sugar to the bowl. Add green papaya and toss well. To make this salad vegan, remove the dried shrimp and use soy sauce instead of fish sauce. As I don’t have palm sugar, I substituted it with regular sugar. As usual, the amount of seasoning; fish sauce, sugar, chillies, lime juice are very taste subjective so you can adjust them accordingly. The above is made accordingly to our liking.